Clementon Police Department is seeking responsible individuals interested in applying for positions as crossing guards. Training and equipment will be provided by the police department. Candidates must be able to pass a background check and have reliable transportation. "Full-time" crossing guards are on duty up to 15 hours per week. "Part-time" crossing guards are on-call and provide service when a "full-time" guard is unavailable. 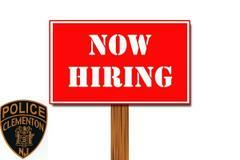 Please stop by the police department for anapplication or call (856) 783-2271 for more information. d. Has not been convicted of any criminal offense involving moral turpitude.